Three SENNEBOGEN 835s for handling bulk goods at Drost B.V. In the middle of this year, SENNEBOGEN’s Dutch sales and service partner Kuiken N.V. was able to transfer three new SENNEBOGEN 835 M machines from the company’s new E-Series to the materials handling service provider, E. Drost B.V. The machines, which are needed for demanding material handling applications, transferring material from ship to truck and for logistics at the storage depot, have replaced their reliable C-Series predecessors. As a long-standing customer, the company was convinced of the quality and reliability of the SENNEBOGEN material handling machines early on, explains owner Ger Drost, who leads the family-run business in the second generation. Consequently a delegation was pleased to come to Bavaria to pick up the machines directly in the plant. The three new, SENNEBOGEN 835 M machines were produced in the plant in close coordination with the customer. Drost, was able to experience the high quality and the know-how of the Lower-Bavarian manufacturer for itself at the factory visit and the delegation was enthusiastic. The enterprise, founded in 1963 today is involved with handling of bulk goods. In this regard, the machines must frequently be deployed at different locations. 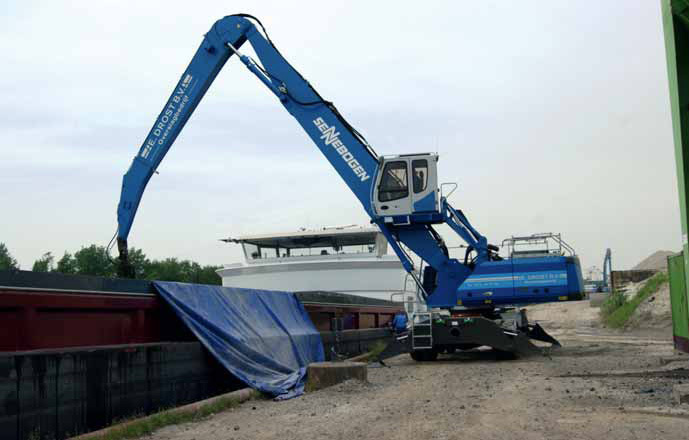 Thanks to a maximum transport width of 3m, the mobile SENNEBOGEN machines can be quickly loaded onto flat-bed trucks and deployed at any location. Currently the machines are working in material handling applications at the inland ports in Drachten,Westerbroek, and Kootstertille, and daily unload tonnes of gravel and chemical fertilizer from the arriving ships and barges. Delivered in the meantime; the new E-Series machines have powerful 9-litre, 224kW Cummins diesel engines. Operators Marco, Martin, and Arjan report that in direct comparison with the predecessor C-Series machines, the material handling capacity has significantly increased. And at the same time, the 835 E-Series saves a lot of fuel, thanks to optimized engine settings, ECO-Mode and idle stop automation. In the combination of 10.1m boom and 7.9m grapple stick, with the new 835 M more than enough reach is available for unloading even larger ships, and to charge the high bulk goods hopper in Kootstertille. In the area of cargo transfer, in particular, the comfortable maXcab, which can be elevated to 5.70m, together with an extensive camera system, offer an optimal overview of the work area and the highest level of work safety. Because the three new 835 M machines will be primarily deployed at ports, they have been equipped with biologically degradable oil. The machines delivered in mid-2014 by the Dutch Sales and Service Partner, Kuiken N.V., were factory painted in the blue corporate colours. Under a full-service contract, Kuiken takes care of regular maintenance and can be reached by Drost around the clock. “With the current machine generation, SENNEBOGEN offers perfection in series production. Designed especially for demanding shoreside cargo handling, again we are relying on the SENNEBOGEN 835 M machines of the current E-Series. Thanks to the high quality and the full-service contract with the Dutch dealer, Kuiken, the machines are always available, this is something we can depend on,” says owner Ger Drost, Drost B.V.